Also known as Historically Inspired Performance or HIP. For a general outline, see the Wikipedia entry on Historically Informed Performance. Richard Taruskin (in ‘The pastness of the present and the presence of the past.’ [Ch. 6] in Authenticity and early music: a symposium , 1988) is ‘convinced that ‘historical’ performance today is not really historical; that a thin veneer of historicism clothes a performance style that is completely of our own time, and is in fact the most modern style around’. Nevertheless he sees value for the modern musician in the study of historical evidence: ‘Really talented performers are always curious, and curious performers will always find what they need in the sources and theorists—what they need being ways of enriching and enlivening what they do’. ‘It is not the elimination of personal choice from performance [achieved by following the ‘rules’ to the letter and to the exclusion of all else thus clearing away accretions] that real artists desire, but its improvement and refreshment. And for this purpose original instruments, historical treatises, and all the rest have proven their value’. See Introduction to Historically Informed Performance Practice: an extract from Greg Dikmans, ‘The performance practice of early 18th-century French flute music’ (MA Thesis, La Trobe Uni, 1991), from which the quote above is taken. Leopold Mozart’s Versuch einer gründlichen Violinschule (Essay of a Thoroughgoing Violin School) published in Augsburg in 1756. By studying these treatises, which complement each other beautifully, we can form a detailed picture of musical taste and performance practice in 18th-century Europe. Quantz’s Versuch is so much more than an instruction book for learning the flute. Only five of its 18 chapters concern the flute exclusively. The rest of the treatise deals with all aspects of performance practice in a way that is not only more comprehensive but also more concrete than ever before. It expounds one musician’s ideas on how to become a complete 18th-century musician. Those of us interested in historically informed performance are indebted to the pioneering work of Edward R. Reilly who published a complete English translation (with introduction and notes) of Quantz’s Versuch in 1966, as well as several scholarly studies relating to Quantz and his works. A second edition of Reilly’s translation appeared in 2001 and a Kindle ebook edition in 2011. Reilly notes that the Versuch is divided into three separate but closely related treatises. The first 16 chapters deal with the education of the solo musician and include the rudiments of flute playing. But they also include information of general interest: the basic forms of ornamentation, how to practice, how to develop the ability to recognise and convey the character of a piece of music, the various types of fast and slow pieces and their appropriate execution, dynamics, free ornamentation, cadenzas and performing in public. Chapter 17 — ‘Of the Duties of Those Who Accompany’ — takes up approximately one third of the book and includes information about tempo markings, intonation, problems of balance, the size and arrangement of an ensemble and the duties of the leader of an orchestra, the ripieno violinists, the viola players, the cellists and double bass players and the keyboard player. The final chapter — ‘How a Musician and a Musical Composition Are to Be Judged’ — includes descriptions of most of the principal types of composition of the time, especially those favoured in the courts of central and northern Germany. It also compares and evaluates the Italian, French and German styles of performance and composition. 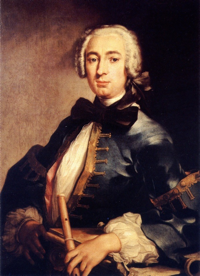 Quantz’s musicianly qualities are manifest on every page of his work, for he tries to do much more than merely instruct the beginner in the rudiments of playing. Instead, he does really try to capture in prose those qualities that make up a sensitive performer. … [T]he work is especially fascinating … for the insights it gives us into the sorts of musical problems faced by 18th-century musicians, which turn out to be, not so surprisingly, the very same problems that face musicians today, and probably also at all other times: how to play in tune, how to play expressively, and how to phrase beautifully and with good taste.